First performance: 6 June 1971, New York Kammermusiker, The Brooklyn Museum, NY. Published by Manduca Music. American Music Project selection of the Clarion Wind Quintet, North Carolina School of the Arts, 1976. NPR, Voice of America, WGBH-FM (Boston), KVPR-FM (Fresno), KSUI-FM (Iowa), WCLV-FM (Cleveland), WCNY-FM (Syracuse), WPRB-FM (Princeton), Maine Public Radio & WCMU-FM (Michigan. Solaris Wind Quintet; Pacific Symphony Wind Quintet, Camerata Woodwind Quintet, Albemarle Ensemble (University of Virginia), Bakersfield Symphony New Directions concert, Sam Houston State University Faculty Wind Quintet, East Wind Quintet, Symposium V for New Woodwind Quintet Music, University of Georgia; Dana Wind Quintet, Midwest Regional Conference, American Society of University Composers, DePaul University; Fourth Annual Festival of Contemporary Music, Cornell University; 35th Festival of Contemporary Music, Louisiana State University; by ensembles at Cincinnati Conservatory, Youngstown State University, University of North Carolina-Greensboro, The University of Akron, The College of Wooster. "(An) appealing, inventive score . . . . Evokes baroque forms in short movements of glistening personality." "A very well crafted work idiomatically conceived for each of the instruments . . . . Should please performers and listeners alike." 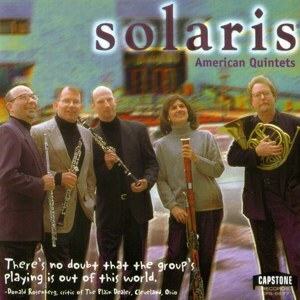 "One of the best woodwind quintet records I've ever heard . . . . Solaris presents . . . five relatively unknown gems (including) Jack Gallagher's splendid Ancient Evenings and Distant Music. . . . I can't praise enough the artistry of the playing . . . and the brilliance of music on this disk." Copyright © 2008-17 Jack Gallagher Music. All Rights Reserved.